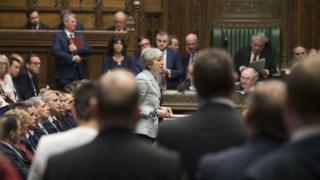 The PM was dealt a fresh blow as the government was defeated by 27 votes on Monday, on a plan designed to find out the kind of deal MPs would support. Thirty Conservative MPs rebelled, including three ministers. Mr Hancock said the government would listen to MPs but “can’t pre-commit to following whatever they vote for”. He told Radio 4’s Today programme that the Commons had rejected no deal and a second referendum, and urged MPs to back the PM’s Brexit deal. But Labour’s Hilary Benn said MPs have to take responsibility for the Brexit process because the government was not doing its job. Jacob Rees-Mogg, chairman of the Eurosceptic group of Tory MPs the European Research Group (ERG), is among the group of pro-Brexit MPs who the prime minister has been trying to persuade to back her deal. European Parliament’s Brexit co-ordinator Guy Verhofstadt said he was “very pleased” the Letwin amendment had been voted for “because that means it is possible now to work towards a cross-party proposal”. Tuesday: Theresa May has a meeting of her cabinet. Tuesday had been considered as a possible day for the so-called third meaningful vote on Mrs May’s withdrawal deal. But, on Monday, the PM said the deal did not have enough support to get through the Commons “as things stand”. Wednesday: This is when indicative votes would be held – we don’t know yet whether MPs will be free to vote how they want or be directed along party lines. Mr Burt, who resigned as Foreign Office minister on Monday night, said in a statement that he had opted to defy the whip “for the country’s sake”. He said the UK was “running out of time” to find an alternative and added that Parliament should seek other options without the instruction of party whips and the government “should adopt any feasible outcome as its own”. Former industry minister Mr Harrington said in his resignation letter that in his role he had been told the government approach was “resulting in cancelled investment decisions, business being placed abroad and a sense of ridicule for British businesses”. Mr Brine, who quit as a health minister, said he believed the PM’s deal was the “best of the options” and for those who do not like the deal “maybe they will realise that the House of Commons is prepared to act and anything from here, as far as they’re concerned, gets softer”.